The first real Mother’s Day can be traced back to an ancient Greek Festival dedicated to Rhea, the Mother of the Gods. However, the phrase “Mothering Sunday” was believed to have first been established in England, in the 1600’s as a day when servants were encouraged to return home to their ‘mother’ or local church as well as spend some time with their mothers and families. Often mothers received gifts such as a Furmety cake, made from wheat, milk, sugar and spices. In Northern England and Scotland, pancakes (known as Carlings) made from steeped peas and fried in butter with pepper and salt were served (not sure that sounds very appetising actually!). In the UK, Mothering Sunday is still celebrated on the fourth Sunday of Lent. 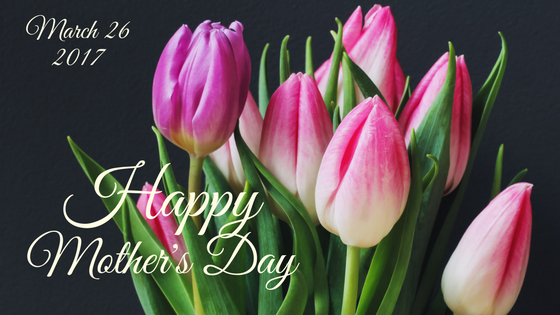 The modern international version of Mother’s Day was first celebrated in 1905, when a woman named Anna Jarvis held a memorial for her mother in Grafton, West Virginia, USA. Anna’s mother Ann Reeves Jarvis had run Mother’s Day Work Clubs to promote public health issues and Anna wanted to continue her work as well as set aside a day to honour all mothers. After nearly ten years of campaigning, Anna got her wish in 1914 when a proclamation was signed by Woodrow Wilson which designated a Mother’s Day national holiday in the USA to be held on the second Sunday in May. Mother’s Day is also now celebrated around the world, normally in May following the USA’s lead. In Mexico Mother’s Day is a serious affair and is said to be the busiest day of the year for Mexican restaurants. The day is full of celebration with flowers, music, food and often a morning serenade of the song “Las Mananitas” from mariachi singers! In the former Soviet Union, International Women’s Day on March 8 was the date used to celebrate mothers. However, in 1998, post-Soviet Russia introduced Mother’s Day on the last Sunday in November, although most of the gift giving and celebrations still happen in March. In Thailand, Mother’s Day is observed on August 12 on the birthday of Queen Sirikit. Parades are often held and jasmine flowers are offered to mothers. Of course, in Windsor, Mother’s Day is the day to take your mum out for Sunday lunch or afternoon tea with gifts of flowers or chocolates! The Boatman has a Sunday roast as normal on Mothering Sunday and will have a special menu, but Sunday being a popular day anyway, you are advised to book if you want to guarantee a table.